Yesterday the Missouri House third read and passed HB 2069 & 2371 by a vote of 120 in support to 34 opposed. HB 2069 & 2371 will place in statute accountability for abortion clinics in their disposition and tracking of the bodies of babies killed through abortion. This bill also increases information and reporting requirements in future inspections of abortion clinics. Also yesterday, the Missouri Senate gave final approval on resolutions SR 1793 & SR 1794, addressing subpoenas issued to Planned Parenthood and the Pathology Lab Director to appear before the Missouri Senate on Monday, April 25. These subpoenas were issued because the Senate had requested information from Planned Parenthood and the Pathology lab that has, to date, not been received. Click here for full MRL press release. 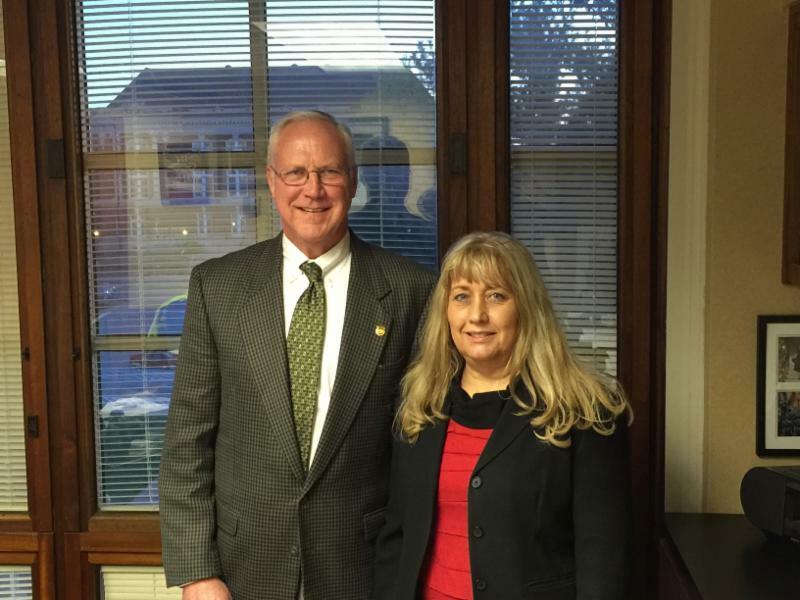 Click here for a statement from Rep. Mike Cierpiot (pictured above with MRL Legislative Liaison, Susan Klein) on the passage of HB 2069 & 2371 (scroll down). Click here for the full legislative update and information on all of the bills we are keeping an eye on. After much discussion Thursday morning, the House of Representatives, with an overwhelming veto-proof majority passed HBs 2069 and 2371 that prevent the sale or donation of fetal remains or tissues that result from an abortion...read more. Missouri lawmakers in a rare move on Thursday voted to summon the CEO of a regional Planned Parenthood to explain why she should not be held in contempt of the state Senate for defying a subpoena that demanded documents on how the organization handles fetal remains...read more. After a vote in the Missouri Senate on Thursday, Mary Kogut faces the possibility of 10 days in a county jail for refusing to comply with Senate subpoenas...read more. Another clear example of the lack of need for freshly aborted fetal tissue in virus and vaccine studies are the recent reports on the susceptibility of developing human brain cells to Zika virus...read more. Abortion activists are resorting to increasingly dishonest tactics to attack Missouri Senators who are investigating Planned Parenthood...read more. Too many physicians today lack compassion for their patients and fail to connect with families on any level...read more. With the exception of Maude (an awful left-wing 1970s TV show) and some "edgy" HBO series, there have been no major sitcoms in which a character has had an abortion...read more. According to Reuters, two abortion doctor training programs are reporting a new influx of students this year...read more. We are in a situation, with the current Supreme Court vacancy, under which whoever gets to appoint the new justice can definitively shift the High Court's ideological balance...read more. April 16 - Jefferson City - 2-4 pm Open house at new Pregnancy Help Center facility, 1760 A Southridge Dr.
April 19 - Rolla - Simon's Law Rally, 6 pm at the Phelps County Courthouse, 200 North Main Street. Click here for a flyer. April 23 - St. Louis - Third National Day of Protest Against Planned Parenthood, 4251 Forest Park Blvd. 9:00 a.m. - 11:00 a.m. Hosted by Defenders of the Unborn. Susan Klein, MRL legislative liaison, and Pam Fichter, MRL former President and current Eastern Region chairman, will be guest speakers. April 23 - Overland Park - National Day of Protest Against Planned Parenthood, 4401 W 109th Street. 9:00 - 11:00 a.m.
April 23 - Columbia - National Day of Protest Against Planned Parenthood, 711 N Providence Rd. 10:00 a.m. - noon. Patty Skain, MRL Executive Director, will be a guest speaker. April 23 - Joplin - National Day of Protest Against Planned Parenthood, 710 Illinois Ave., 9:00 - 11:00 a.m.
June 18 - Jefferson City - Save the date! MRL Statewide Meeting, 10 am at Pleus Hall, 1208 E. McCarty St. Lunch will be provided.